Summer is coming, and humidity is a huge issue which leaves Lexington residents struggling for comfort throughout the season. Outdoor humidity is impactful, but the humidity inside your home is a more serious issue which hinders comfort and air quality. Too much moisture can also be damaging. The solution to balanced indoor humidity is a whole home dehumidifier. These systems work directly with your home’s heating and air conditioning systems to keep humidity levels steady throughout the entire home. With balanced humidity comes great benefits, which we discuss below. Too much moisture indoors is an air quality issue. It can cause mold and mildew growth – exposure may have serious health consequences to your family. More moisture in the air can increase allergen concentration, enhancing the symptoms allergy sufferers experience inside. It also contributes to the breeding of insects, which can pose a health threat to your family. Excess moisture is responsible for musty smells and stuffiness inside. A whole home dehumidifier will treat all the air in the home, reducing odors and the likelihood for bugs, mold, and allergens to stick around. The result? Better air quality and improved health! When too much moisture exists in your air, it can build up on surfaces throughout the home. You’ll notice condensation on windows and pipes, the walls and floors may feel damp, and you may see water spots on ceilings and walls. High moisture levels can damage woodwork, causing flooring, cabinets, and wood furniture to warp. Balance humidity indoors to keep damaging moisture issues at bay. 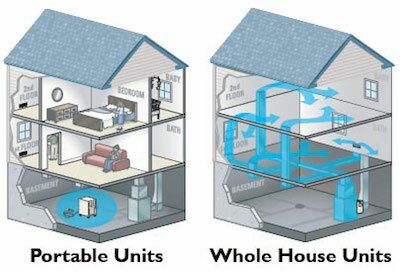 A whole home dehumidifier protects your home from moisture’s destruction. High humidity inside makes it difficult to stay comfortable – you may feel sticky indoors in the summer, and clammy over the winter. You may notice you’re sweating more inside. With balanced humidity, you’ll feel more comfortable indoors. Your body will be capable of keeping itself cooler, as it isn’t battling against high moisture. You can keep your thermostat at a higher temperature through the summer without losing comfort, saving energy and cutting utility expenses. Climate Control installs efficient whole home dehumidification systems that work with your heating and cooling systems to balance indoor humidity throughout the year. Contact us today to learn more about the benefits of balanced humidity!